For months now, I’ve been getting emails from food sustainability organizations with subject lines like “Kiss Your Organics Goodbye!” and “48 Hours to Stop Monsanto’s GM Alfalfa!” They’re in reference to a genetically modified strain of alfalfa that is in testing for public use by the United States Department of Agriculture. What’s wrong with the alfalfa? Well, for one thing, it’s made by Monsanto, a corporation with a reputation for lawsuit slinging and questionable ethics. It’s also “roundup ready,” meaning it’s engineered to withstand applications of Monsanto’s herbicide “roundup,” so farmers can slather on the weed killer without worrying about damaging their crop. But plenty of sustainability advocates would simply tell you that what’s wrong with the alfalfa is that it’s a GMO–that is, a genetically modified organism produced through human engineering. Enter Pamela Ronald and Raoul Adamchak, a couple of garden-tending, organic-eating, hen-raising, vegetarian academics who think this alfalfa is a good thing. Adamchak runs the organic student farm at the famed University of California, Davis agricultural program, hoeing melons and solarizing carrots for a living. Ronald, Adamchak’s wife, is the chair of the Plant Genomics program at UC Davis where she genetically modifies rice for traits like the ability to withstand a flood. 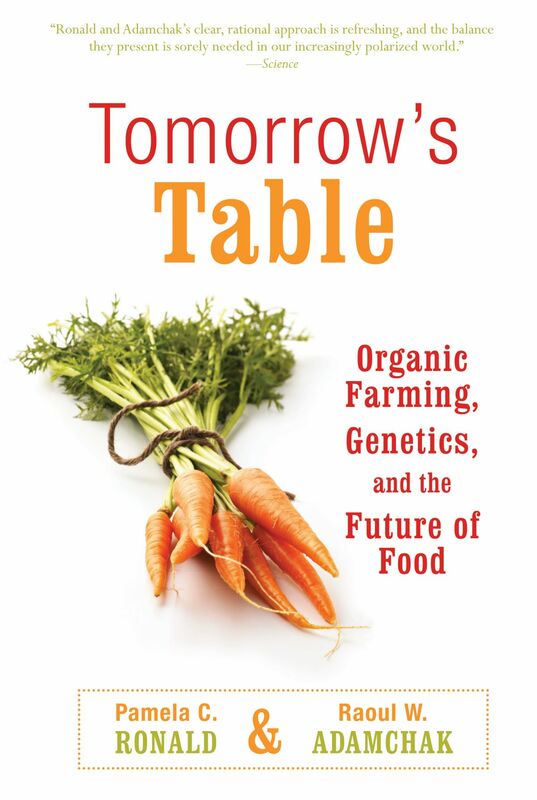 The couple wrote a book together called Tomorrow’s Table in which they make the case that those two activities –genetic engineering and hoeing–are just two forms of weed control. 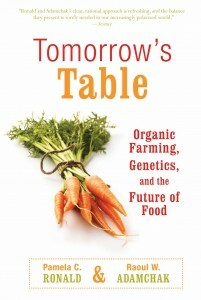 In separate chapters from their two perspectives, Ronald and Adamchak try to convince their readers that organic and genetic engineering (GE) are not antithetical to one another and there’s no reason why they can’t both have a prominent place in the toolbox of sustainable agriculture as it’s applied to fix this broken food system. They argue, in my opinion convincingly, that the genetic engineering of plants is just a tool, and that sustainability activists should be fighting for its careful application, rather than against its very existence. There’s a second important focus of the book: transparency and the lack thereof. And this is the part that’s of special interest to Jewish sustainability activists–according to halakha (and Rabbi Steve Greenberg), in any exchange, the seller has a moral obligation to provide full information on his or her product, and the buyer has the right to full transparency. But we eat in a system that protects the rights of companies not to disclose their ingredients, and we vote in a system where hysteria and propaganda are way more common than reason and transparency, so the onus is, finally, on us both to seek transparency in what we read and to supply it in what we write. In Tomorrow’s Table Ronald hopes that by giving readers full information on what genetic engineering entails, she’ll allow them to come to their own conclusion that the process itself is nothing to be afraid of. In terms of transparency, the most pertinent chapter is the one on politics, in which Ronald debunks some of the less-than-transparent methods of activists in the sustainability community by showing that our arguments against genetic engineering are based on limited or suspect research. Her consummate example is a flyer distributed in one California county urging voters to pass a proposition that would ban growing any genetically modified crops whatsoever. The flyer cites the results from a “study” that, as Ronald shows, seems to have been carried out by a teenager at home with no independent verification except for the pride of the kid’s own mother. It does make that particular county look pretty silly, but more importantly, it points to the sometimes-dubious rhetoric and lack of citations within the sustainability movement–rhetoric for which we can and should take responsibility as a community. Not that Ronald is a paragon of transparency–the flyer she’s discussing is a pathetically easy target. On the same issue (the safety of genetically engineered produce in our bodies and in the fields) she might have discussed the less flashy, but more commonly cited claims of Árpád Pusztai, who’s an actual scientist, or Mae Wan Ho, who’s a scientist with anti-GE studies published in peer-reviewed journals. Both of these scientists have been repudiated plenty of times, and it wouldn’t strain Ronald to go a round with them. Still, when it comes to transparency, her overall point is valid–we’ve been relying on a lot of alarmist rhetoric when it comes to GE, so much so that your author, a long time reader and writer on sustainability blogs and signer of petitions, is feeling a bit sheepish of late. I’ve noticed that the anti-GE alfalfa articles I read are generally characterized by calls for “more testing” while simultaneously vowing to continue the fight even if the USDA approves the seeds when the tests are concluded. Those mixed messages undermine our credibility as a group, and as individuals, they undermine our ability to respond meaningfully to questions about the issues we believe in. Ultimately, if Tomorrow’s Table’s conclusions are accurate, I think they are good news. After all, if, as Ronald and Adamchak claim, there is nothing fundamentally wrong with genetic engineering as a method of plant breeding, then we can stop trying to convince people that there is, and instead we can focus on the concrete issues of patenting, ownership, and lawsuits. We can talk about how these miracle products–like the much touted golden rice that you see in Monsanto’s TV spots and read about in Tomorrow’s Table–have been stuck in development and distribution limbo for years while somehow the financially-beneficial-but-totally-useless-to-anyone-who-doesn’t-have-a-weed-problem “roundup ready” seeds shoot through the approval process like a greased (or anyway, greasier) weasel. We can talk about how heinous lawsuits against American farmers and the lack of necessary support for their most vulnerable customers make Monsanto directly and indirectly responsible for bankruptcy and death all over the world. We can talk, in short, about the policy issues and the policy solutions that might actually make a difference in how, and for whose benefit, GE technology is deployed.